CHROME FINISH STANCHION WITH GRAY RETRACTABLE BELT This steel stanchion has a chrome finish base and post that gives the post a sleek look yet high quality at low cost. 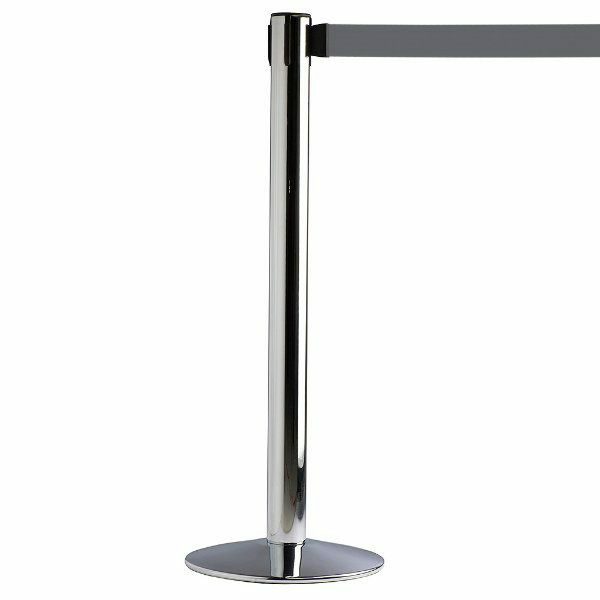 With these retractable queue control stanchions or as also known retractable crowd control systems, it is easy to control the crowd, form lines or queues, restrict access to specific areas, indicate off-limits areas or protect any merchandise, seperate people in to groups in any environment. Each gray belt features a built-in locking mechanism. 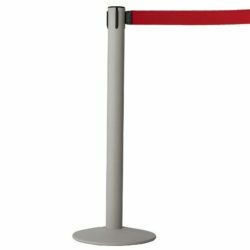 The belt of this chrome finish retractable barrier post can extend up to 114- 1/6” with a printable area of 1- 4/7” x 103- 2/7”. 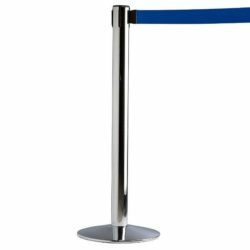 The height of only the post is 35- 3/7” and the complete height of the stanchion is 37”. This retractable queue control stanchion has a 4 way post cap that allows you to connect the belt any of 4 sides. Just unhook the belt from one station to connect to the other. 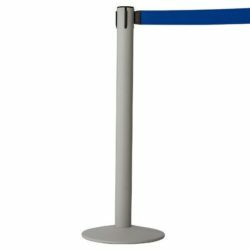 Depending on the size of the area and layout, required quantity of post can be placed and connect to the each other. Assemble and dissamble only take a couple of minutes for storage and transport.